At first I couldn’t believe that I would be writing a blog post about toilets, but when I realized that the discount was on low-flow toilets, I couldn’t not talk about this offer. So this weekend only, save 30% on select models of low-flow toilets at Home Depot. I also just discovered that there are some municipalities across Canada that offer mail in rebates for citizens who buy a low-flow toilet. 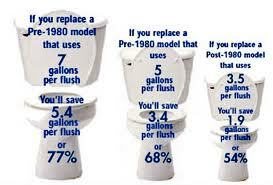 You can find the list of cities that offer a rebate on low-flow toilets using this link. This is such a nice program, it would be more interesting if all the cities would offer the same incentives for the environment. To give you a rough idea, only two municipalities offer the rebate in Quebec. And the money back goes up to $100, which is really honestly very generous. Did you know that toilets use approximately 30% of the indoor water in a house? This is crazily high! If you change your toilet for a dual-flush one, you could use up to 77% less water, which is quite a lot by anyone’s standards.